There have been several polls since my last update, and they have varied much more than usual. But the bottom line, with all the data, is a small decline in the trend estimate, and that well within the uncertainty of the trend. If we look at the residuals, NPR looks like a high outlier and Harris a low one. 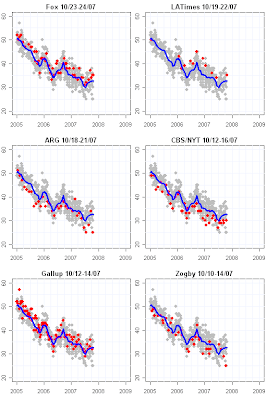 But Zogby/Reuters and ARG are even more extreme low outliers. Zogby uses the same 4 point job rating measure that Harris uses, so that partially explains their low value (a persistent question wording effect) but as the plot makes clear, the Zogby reading is even lower than we'd expect from that. The ARG reading is also extremely low, at the same 25% approval rating, and the points and labels are overwritten by each other. The curiosity is why two (three with Harris) outliers? Did opinion change and these caught it early? Apparently not, judging by other recent polls that are at or even a bit higher than the trend estimate of 32.6%. 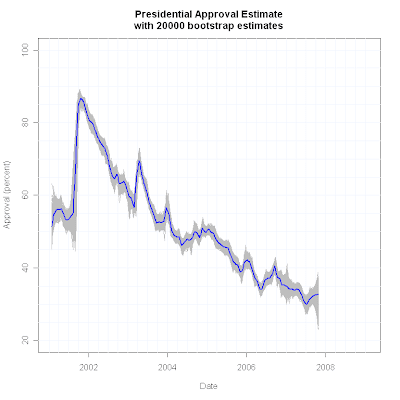 The bottom line is approval may have shifted down a tad, from 33.0% to 32.6%. BUT, one should consider the gray region around the trend line below. This gives you a good idea of the uncertainty in the trend estimate itself, after squeezing out as much random variation in the polls as possible (at least until next week! Stay tuned for that!). 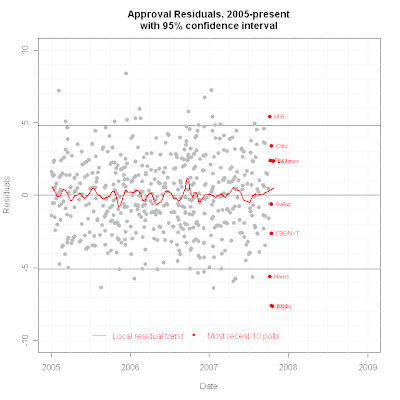 Clearly the change of .4 percentage points is not a clear indication of movement in approval. 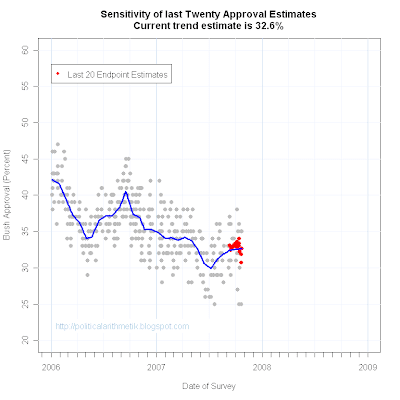 In fact, given the wide range of current polling, we have an unusually wide uncertainty about where approval actually is at the moment, with 32.6% being our best estimate, but an uncertain one. 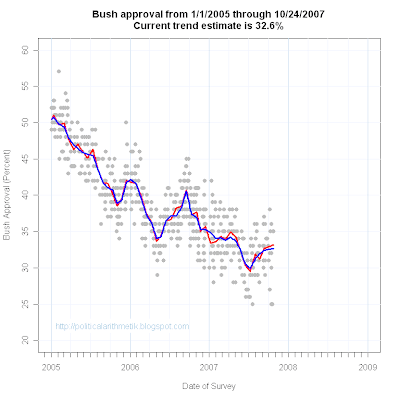 We are in a period of relative stability in President Bush's approval rating but considerable polling variation. Waiting for the next "thing" to happen.